Roof Cleaning is an important step to prolonging the life of your most important protective surface. Stains, leaves, debris, growth of algae, moss and lichens and even excessive bird droppings can all be harmful as well as unsightly. Call us to get your dwelling back to looking great and staying that way. 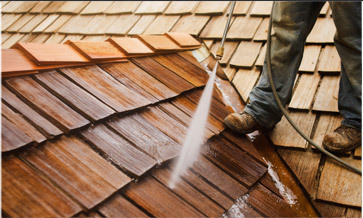 Roof cleaning removes any and all foreign materials from your home or business and prevents breakdown and deterioration of shingles and the underlayment beneath. Many different situations can create staining, unwanted growth or accumulations. They are all potentially damaging if not eliminated right away. Our team of professionals has the experience and skill to identify and correct the situation before further damage occurs. Leaves and Debris: Overhanging branches can deposit leaves, twigs, needles, acorns and other seeds. These can accumulate in valleys, along dormers, and in gutters. Left alone, they decay and stain the shingles, and retain moisture. Eventually the seeds can sprout and actually put out roots that get under shingles and cause the underlayment and decking to rot. They block the flow of water in gutters and cause ice damming in the winter, forcing water up and under the underlayment. The water gets into the interior walls causing mold, a potential health hazard. We will remove all debris through regular maintenance. Algae: Wet weather, which is prevalent in the Northwest and shade, can cause algae growth on shingles. This usually appears as long black streaks on the north side of a sloped surface. Algae feed on the limestone in shingles and will eventually cause loss of the granular surface that protects them from sunlight. We will kill algae growth and make recommendations to prevent its return. Moss: Roof cleaning in Spokane eliminates this growth, which appears as thick green carpet-like patches on shingles and which holds harmful moisture in place. The moss feeds on the lime in the roofing material, and can loosen shingles and shorten their lifespan by removing the granular layer that helps protect them. The shingle edges become weak and are susceptible to wind damage. We will destroy moss and prevent its return. Lichens: These are usually grayish green and leathery, scale-like patches. They are fungi and algae that live symbiotically together. They cause the same damage as moss and are dealt with the same way. Bird Droppings: Certain birds like pigeons and gulls can take up residence and make a mess out of your roof. These droppings are more unsightly than harmful unless they are allowed to accumulate. When we perform a roof cleaning, we remove all loose debris by hand and then apply special solutions to destroy the growth of algae, moss and lichens to prevent their return. We never use chlorine based products or pressure washing. These harsh processes can be potentially harmful. We highly recommend regular cleanings, periodic inspections and cleaning of your home or business’ uppermost surfaces to maintain your roof in a manner that does not promote fungal growth. We can also trim away tree branches, remove leaves and debris before they accumulate, and identify any areas where growth of invasive plant life may be beginning. We can eradicate it prior to its gaining a foothold. We believe that prevention is the best remedy.